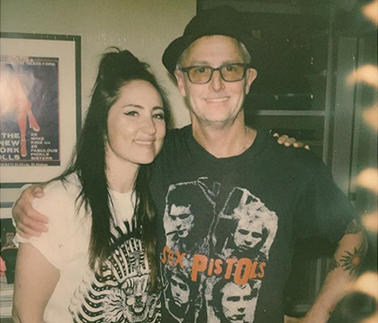 Pearl Jam guitarist Mike McCready has joined Scottish singer-songwriter KT Tunstall for a cover of the 1989 Tom Petty classic, “I Won’t Back Down”, in support of peaceful protest worldwide. Produced by McCready, Tunstall’s version sees the Seattle rocker on guitar and backing vocals with Thunderpussy’s Leah Julius on drums. "The three musicians felt it would serve as a loud shout of support to all the people all over the world marching, protesting and standing up for justice and equality," says the trio in a joint message. "Power to the people!" Fans were invited to take part in a collaborative music video for the song – directed and edited by Mark Haldane – where they sent in footage from marches and gatherings they have attended for positive causes; this footage has been incorporated into a video to demonstrate the power people have to change the world. Proceeds from “I Won’t Back Down” will go to Pearl Jam’s Vitalogy Foundation, a public non-profit organization that was founded in 2006 by the band to support the efforts of non-profit organizations doing work in the fields of community health, the environment, arts and education and social change. McCready and Pearl Jam will begin a European tour in Amsterdam on June 12 before playing a series of select US stadium concerts in August. The group will begin the run at Seattle’s Safeco Field on August 8 and 10 while pledging a minimum of $1 million toward local homelessness initiatives while challenging everyone to join them towards raising a minimum of $10 million for the cause.